If the name Spanish Chestnut sounds familiar, it should. Back in 2005 he, along with future stallions Bellamy Road, Flower Alley, Afleet Alex, Sun King, Don't Get Mad, and others were loaded into the gate for the 131st running of the Kentucky Derby. Spanish Chestnut broke alertly and shot to the lead to post one of the fastest opening quarters (:22.28) and half miles (:45.38) in Kentucky Derby history. While he faded to finish 16th in the Derby, he stamped himself as one of the major sprinters in North America that year. By the time he retired from racing, he'd won four races, including the $150,000 San Rafael (G2) and had placed in the $200,000 True North Handicap (G2), $200,000 Santa Catalina Handicap (G2), and the $443,200 Commonwealth Breeders' Cup Stakes (G2), among others. All that running made for some sore tootsies, so the Derrick Smith and Michael Tabor-owned Spanish Chestnut called it a career and was retired from racing at age four. 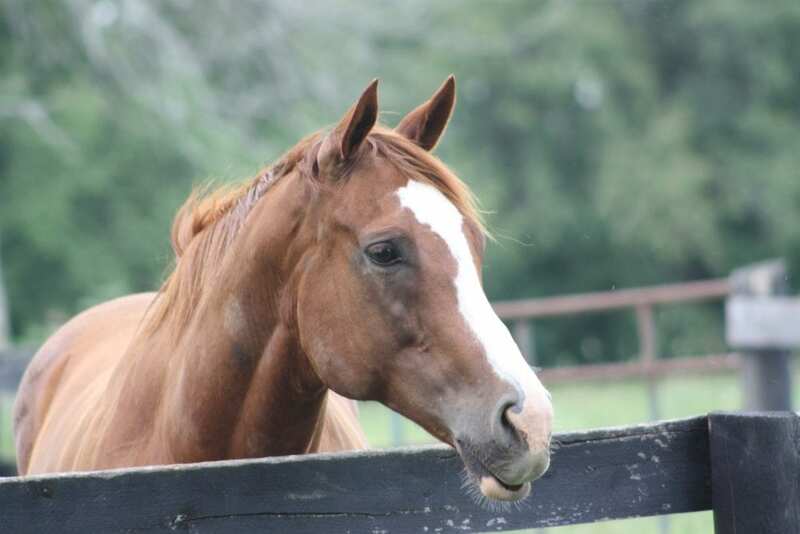 Ashford contacted Randy and Carrie Gilbert of R Tradition Farm, who often take in retired racehorses and reschool them as hunter/jumpers, eventers, dressage horses, or foxhunters and asked if they could help find the perfect home for Spanish Chestnut. At the same time, then-60-year-old Susan Enslow of Lexington, Ky., was thinking about getting a horse to play around with. Enslow had grown up on a farm and had ridden throughout her childhood, but it had been decades since she'd had a horse and had ridden regularly due to career obligations as an educator and later as an epidemiologist. With the added spare time that retirement allows, Susan decided it was time to get back in the saddle, so she asked around and was referred to Randy and Carrie Gilbert. The Gilberts had two horses they thought might suit Susan, “Chet,” as Spanish Chestnut was nicknamed, being one of them. They made an appointment to meet Susan at Masterson Station Park's equestrian grounds so she could try the horses out. “When we unloaded the horses, [Susan] fell head over heels for Chet almost immediately,” said Carrie. “Susan hadn't been in the saddle for quite some time and was looking for a quiet, easy-going horse to take her along. “We rode both horses around Masterson and…Chet wasn't really that good to be honest. It was his first time off of the farm and the first time he was being asked to do much. He wasn't the bravest horse we've ever been around,” Carrie said with a chuckle. As they rode around the grounds, Chet showed his stubborn side, not wanting to go forward and spooking here, there and everywhere. That didn't matter to Susan, though. There was something about his personality that stole her heart. By the end of the week Chet was in his new home with Susan and the pair has been inseparable ever since. Susan's favorite activity with Chet, however, is her weekly ladies day with a few of her other equine-inclined friends. Susan said some of her friends showed concern when they heard about her getting a Thoroughbred off the track, and that concern was only heightened when they found out who the horse was and that what made him famous was his quick turn of foot. Susan, however, has a completely different take on off-track Thoroughbreds as it relates to those in her stage of life. Susan is well aware that, at just 10 years of age, Chet may have a few more years of riding left in him than she does. Thanks to careful planning, though, Chet will never want for anything if that time ever comes. For Chet, his life is the ultimate and unlikely tale of Derby horse makes good. Jen Roytz is the marketing and communications director at Three Chimneys Farm in Midway, Kentucky. She also handles the farm's Thoroughbred aftercare efforts. She currently owns two retired Thoroughbreds: Point of Impact (by Point Given; a.k.a. Boomer), who retired from racing in late 2011 and is just starting back under saddle to find his forte as a riding horse, and Shotgun Shine (by Tale of the Cat, a.k.a. Gage), who is in training as a hunter/jumper. Contact Jen on Facebook and Twitter. This entry was posted in OTTB Showcase Archive and tagged Horse Racing, Jen Roytz, spanish chestnut, thoroughbred, thoroughbred retirement, Three Chimneys by Jen Roytz. Bookmark the permalink.